Holy crap. This is incredible. Thank you so much for this. I was in despair over losing Reeder. Once the Mac and iPad versions are updated, I'm going to be in great shape! I will be holding out for 1.7.9, then. no biggie. Is this hardcoded to only work in single user mode? It wasn't working for me, and when I looked at the ttrs_plugins_storage table it looks like it's added the password only for uid 1. I use multiple user mode. I set the password whilst logged in with UID 2 and it works fine for me. The ttrs_plugins_storage shows UID 2. After using this during the day I have a couple of comments/questions. This works fine for unread feeds, but it doesn't look like the all items view works. It can display the list of feeds, but if you go into any of them it's just blank with no articles. Also it appears that reeder downloads its own favicons direct from the website rather than using tt-rss's list of favicons. Are both these things limitations of the fever API or is it something you can work on for future versions? Yeah, call me stupid. I didn't realize I was logged in as my admin account! Argh, please disregard, lol! xtaz wrote: After using this during the day I have a couple of comments/questions. This works fine for unread feeds, but it doesn't look like the all items view works. It can display the list of feeds, but if you go into any of them it's just blank with no articles. Also it appears that reeder downloads its own favicons direct from the website rather than using tt-rss's list of favicons. Are both these things limitations of the fever API or is it something you can work on for future versions? From what I understand, Reeder never (even for Google Reader) downloads 'Read' items from the server, unless it had already downloaded unread items. The "All Items" area will only ever show you unread items that have previously been read (i.e. are in Reeder's cache). Favicons are handled completely by Reeder at the moment. The weird thing is that the Fever API does support Favicons (and I've implemented it to pull down from the feed-icons folder), but, Reeder seems to disregard them. 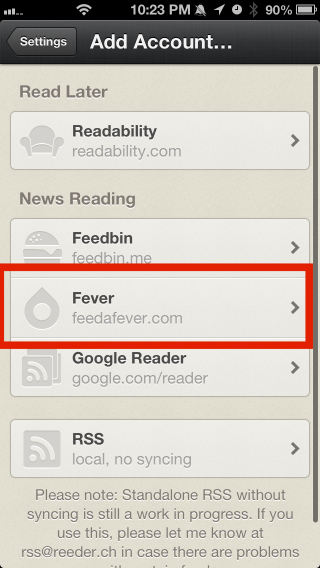 It seems Reeder's behaviour with Google Reader is different to Fevers in this case. Ahhhh I see. Yes if I go into ones that I read yesterday then it works. It was ones which had no unread items to begin with that don't. Yes this behavior is different to google reader. With that there was a switch in the reeder settings to say also sync read items as well with a selectable amount of days. I guess the fever API doesn't let it do this or something. Yeah it's a bit of a shame about the favicons, as reeder has got many of them wrong in my case. About 20 of my feeds don't have a favicon at all, and another 10 all have the feedburner icon rather than the original websites. If it used the icons from tt-rss this would have worked fine. Oh well. Other than those things which are out of your control, the app works pretty well. Thanks very much for it! Back when google reader first announced it was vanishing, the first thing I did after coming back to tt-rss was to email the guy who coded reeder with the link to the tt-rss API page ( http://tt-rss.org/redmine/projects/tt-r ... iReference ) and say it would be amazing if you could support this. If other people do the same thing it might bring it to his attention enough for him to add native tt-rss support. If everyone who uses this plugin does the same it would be good. Power in numbers! Or I wonder how open he would be to collaborating with somebody. I like the idea of several people asking to support tt-rss. I'm going to do that now. Great idea; thanks! I'm having trouble getting this plugin to work. Everything goes smoothly until I try to log in via the Reeder app on my phone, and I keep getting a "Login Failed" error, telling me that the email or password I entered is incorrect. I've tried retyping it slowly many times, so I know neither my username nor my password (the one I set in the Fever prefs pane) are incorrect. I double checked the plugin storage table in my DB, and there's an entry for Fever with the correct UID, so I'm not really sure what's wrong. And yes, I'm using trunk. There are no errors in the system log... where should I start looking? Am I missing something simple? i had the same problem, and after debugging, i realized that i didn't enable tt-rss's api support (within tt-rss settings, not in the fever settings). after that, it worked great! Figured out my problem. 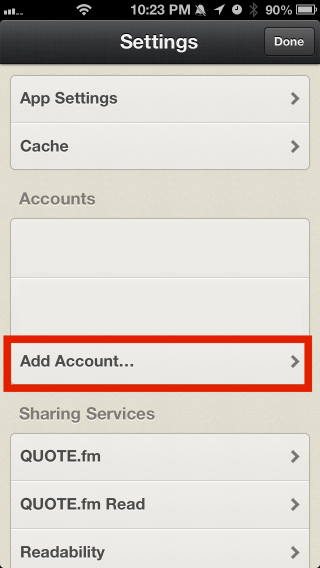 For future reference, you have to enable "Enable API access" under General to let this plugin work. Welp, guess I was missing something simple. Works great, though. This plugin is a lifesaver. Thanks a lot for your work! Do you have plans to share it on github? Holy crap. You just became my best friend of the day. And I will buy you a beer or drink of choice. 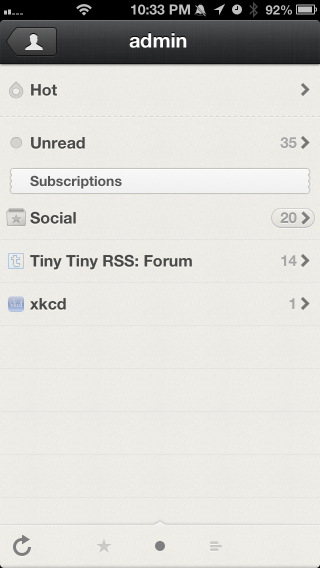 The Reeder app is simply better than any of the mobile UI currently available. I've enabled external API access and I have used YATTRSSC successfully. 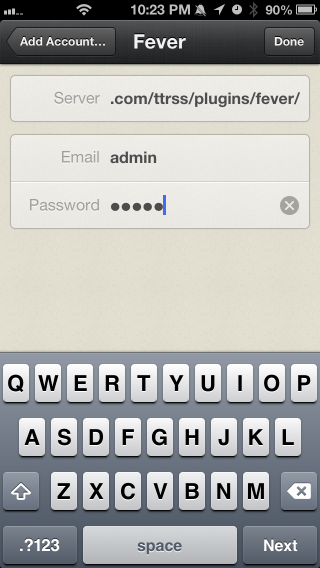 I don't know if reeder has changed its settings, but it no longer asks for a username, but an email. 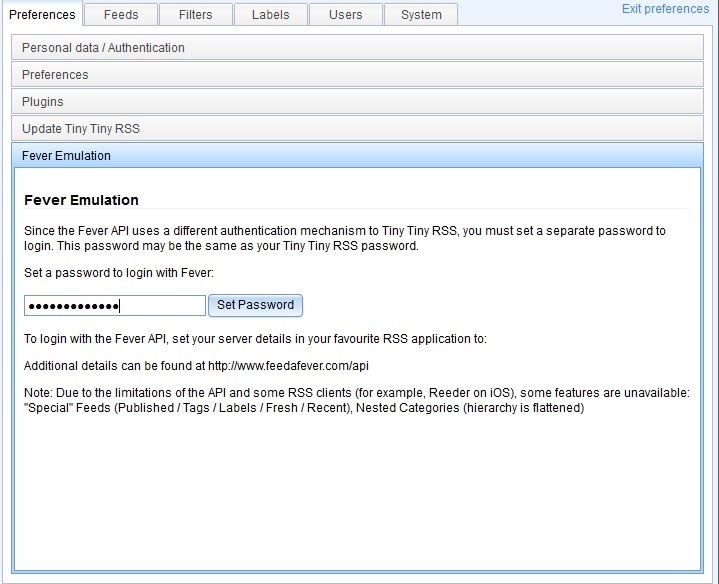 When I enter the email associated with my ttrss login and the password I set for the fever plugin, I get an incorrect password/email error.